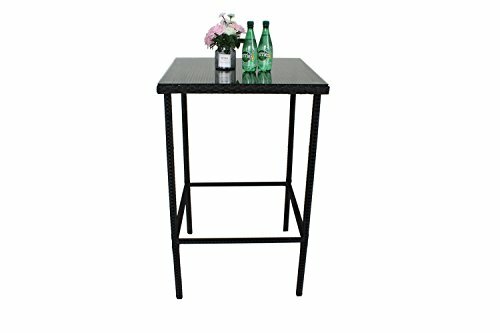 Outime Outdoor/Indoor Wicker Rattan Bar Square Table , which are of contemporary looks and flavor,Black synthetic resin wicker designed for the outdoors. It is weather and UV resistant. Looks great in any setting! You don't have to worry about rust, so you can safely leave it outdoors in all types of weather, This Bar Square Table can be used with your other Outdoor Furniture. If you use with Outime Barstool Set, it will work better.It will have a good effect. -Glass:The smooth design with 5mm thickness can bears more weight and impact, ensuring you a safe use. -Instructions and all necessary tools included for smooth assembly. Specifications:Water Resistant; Rattan Color: Black; Weight: 30.8 lbs;Dimensions:27.5"L x 27.5"W x 43.3"H.
If you have any questions about this product by Outime, contact us by completing and submitting the form below. If you are looking for a specif part number, please include it with your message.